Interviewers conducting surveys in the Central African Republic received thorough training before heading out into the field. During the actual survey, interviewers spent an hour or more with each respondent. The Central African Republic has been plagued by poverty and violence for decades. A random household survey examines how the situation has affected residents' physical and mental health. JAMA, the journal of the American Medical Association, features several research papers focusing on violence as a public health issue. One looks at how conflict in the Central African Republic has resulted in increased illness, mental health issues, and death rates. Survey teams did individual interviews throughout the country to compile first-person information, and they recorded their data on smart phones, to protect privacy by not using paper records. Almost one-third of the people said their physical health was bad or very bad. Symptoms of depression or anxiety were seen in more than half of those surveyed. And lead author Patrick Vinck says the death toll was staggering. "What we found is that this is one of the countries where the people are dying at the fastest rate that you can imagine," he said. 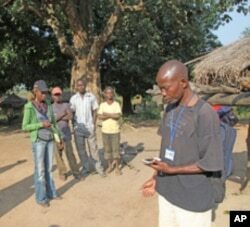 Researchers adapted smart phones to help record responses, the first time such technology was used to conduct surveys in the Central African Republic. "It's about five deaths per 1,000 people per month. The equivalent of six percent of the population dying every year. And that mortality rate is comparable to or even higher to what we have seen in eastern Congo or in the Darfur." Vinck heads the Initiative for Vulnerable Populations at the University of California, Berkeley. He says the deaths and illness they found in the Central African Republic are not all directly caused by the conflict. "There is really a situation of chronic poverty that underlies the conflict that in many ways is more terrible," Vinck explained. "And the result is that the people have very, very little hope. There is no reason why the international community can not come together to address this conflict and put sufficient pressure on the different actors so that they finally resolve their differences peacefully." If conflict and violence in the Central African Republic sounds like a story about power and politics, it is. But speaking via Skype, Vinck says that doesn't mean it isn't also a public health issue. "The reasons it was important for us to publish in the journal of the American Medical Association is that war is a major public health problem. The consequences on health are enormous. And whereas mortality is a very obvious aspect of it, there are many, many other consequences." In addition to the academic paper in JAMA, the journal of the American Medical Association, Patrick Vinck has co-authored a 48-page study of the situation in the Central African Republic, published by the Human Rights Center at the University of California.